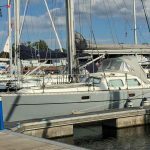 A whole two months have passed since we purchased our 1990 Oyster 435 sailing boat. And what a two months it has been! 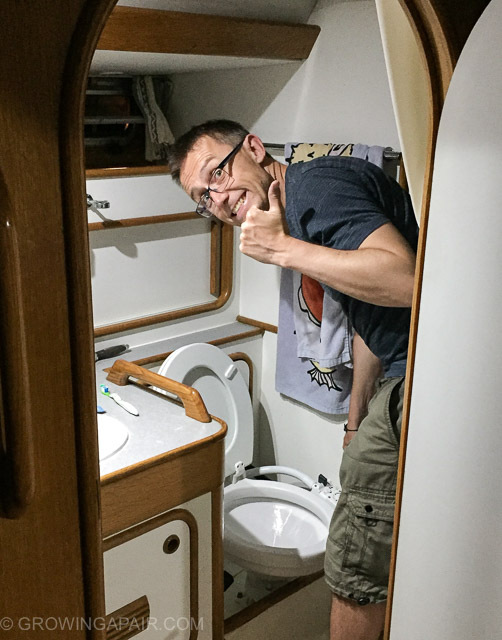 Our slightly naive plan was to buy our perfect boat at the start of the UK sailing season and be sailing confidently around the Solent by the end of said season, having fixed everything that needed fixing, and looking forward to another season of gaining experience and making our boat into a home we can live in. This hasn’t gone quite to plan. It is now the end of the season. Yes, we do finally have our boat on a mooring close to our home. But that took us six weeks. We have been out in the Solent once. There was no wind. And then the anchor windlass broke. So what did we do for those six weekends? We got the boat out of the marina and back in again. What were we thinking? All those lovely boats for sale on the south coast of England, minutes from our front door, and we choose one a four hour drive away. Choosing a boat isn’t as easy as it sounds though. So a boat in Ipswich is was! We travelled up a few times to view the boat and meet the owner and after the stressful process of survey and negotiation, the boat was ours. After that, we spent almost every weekend in Fox’s Marina in Ipswich. We would pick Sam and Evan up from Scouts at 9.30pm, snuggle them up under blankets in the back seat and drive the 160 miles around London to Ipswich, arriving at around 1am. Then we’d have to find the boat in the dark (it could be anywhere in the marina, often rafted up against another boat) and transport all our stuff onto the boat before falling into our bunks. The first weekend was a proper adventure. We found the boat but couldn’t figure out how to switch the electricity on (a random switch under a step by the nav station – obvs!). After fumbling about in the dark with only the lights from our phones, we gave up and crawled into our bunks. The bloke from the boatyard showed us the next morning, whilst shaking his head and tutting a lot. Well, how were we to know?! Waking up on our boat on a Saturday morning has been fantastic. Dez and I slept in the saloon with the hatch open. We fell to sleep listening to the oyster catchers shrieking and the breeze moving through the masts, and woke up to blue skies and the gentle lapping of water on hull. The boys slept in their cabin in the pointy end. Lee cloths turn beds into dens when you’re a kid. And despite having a perfectly good mattress to sleep on, an uncomfortable-looking canvas passage bunk is much more fun. Sam chose to sleep in a tiny canvas passage bunk above Evan’s bed, rather than the perfectly good extra large mattress on the other side of the cabin. I guess it’s more of an adventure in a bunk. During our weekends in Ipswich, our boat was a bit like a floating campervan, just not in a field. We had electricity to run our lights and a camping fridge. Going to the toilet involved visiting the toilet block, a distance away across the field (marina). 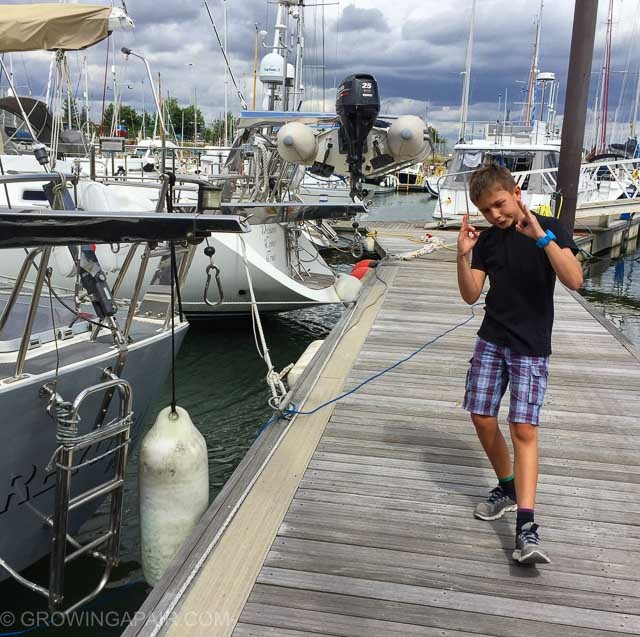 Boat rule – SOS (sh*t on shore), for obvious reasons in a marina. 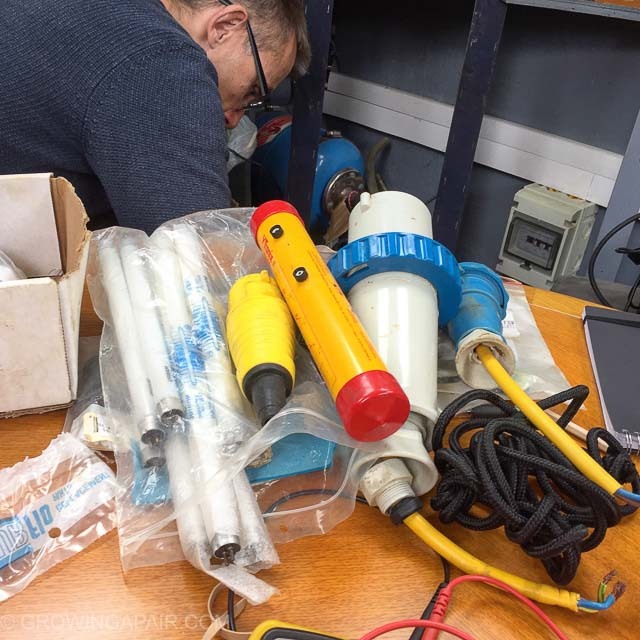 We have no holding tank…. Food was mostly made up of the usual camping, one-pot-slop. Spicy bean slop – fried onion and garlic, tins of random pulses, tin of tomatoes, veg stock cube, lots of chillies. Fresh bread if you’re lucky. Corned beef slop – tin of corned beef, tin of tomatoes, chopped carrots or similar, chunks of cooked potato, veg stock cube. Fresh bread if you’re lucky. We slept in sleeping bags under the stars, with the hatches open. Evenings were spent watching the sun set while sipping a cold beer or two. 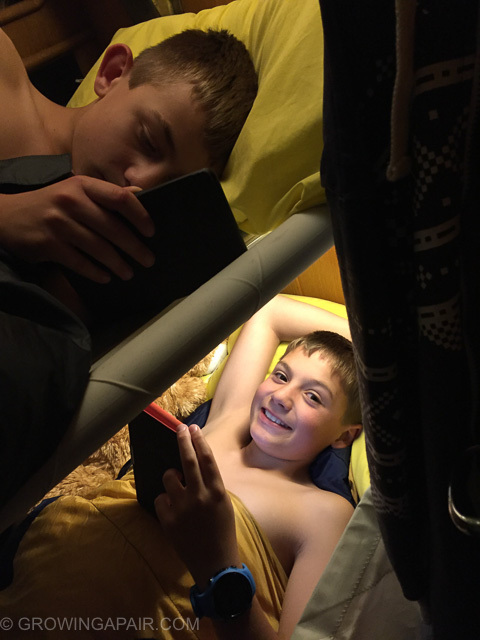 When the temperature dropped the boys would cuddle up under blankets and watch a movie on their tablet. The grownups would cuddle up under blankets in the cockpit and crack open another cold one. In fact, We have found that a lot of the stuff we use for camping and backpacking is really useful on the boat. 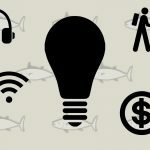 Click here to read our list of must have boat gadgets. 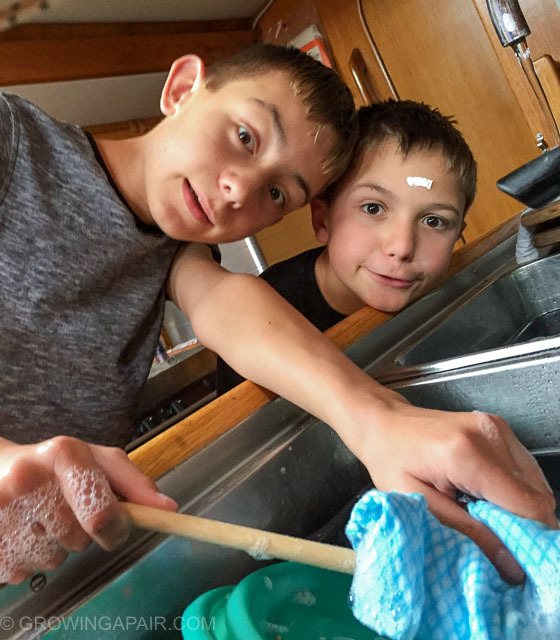 The boys did all the washing up, as is right and proper when camping. Well, Ipswich itself is a bit of a hole (sorry, Ipswich, but you are). But Fox’s Marina has been a fantastic place to spend a couple of months worth of weekends. It’s a small, cramped marina with a big heart and some fantastic characters. It’s really more of a boat yard. It has a small ‘Yacht Club Bar” with beer and quite decent food. For much of the time, our boat was positioned on the pontoon directly in front of the bar. Every job we attempted to do on deck, from fitting the wrong sail to trying to figure out how the davits work, was in full view of the ‘locals’. Some of them have spent much of their time taking the piss out of us, but we like that. Many a time, we’ve looked up from attempting to fix something on deck to hear Kevin, pint in hand, shouting “I wouldn’t do it like that if I were you!”. And we loved seeing Nigel every weekend, heading out down the river by himself on his sailing boat. “It’s a short season. You have to make the most of it”, he told us. Everyone we have met there has been so friendly and supportive. If you are going to have to spend weekends in a marina, there are worse places than Fox’s. Fox’s Marina. Not a bad place to spend some time. Don’t mock! This was a major achievement. I can’t begin to tell you how terrifying this was. It’s a cramped marina with tight turns around the pontoons and very little water at low tide. Our boat is big and heavy. We had no experience of maneuvering a boat like this. In fact we had little experience of maneuvering any boat. And this was our first time driving a boat by ourselves, without a proper professional sailing person aboard to stop us crashing. Boats don’t drive like cars, y’know. Stress levels were through the roof. On top of this, the boat’s throttle cable was a bit dodgy. The engine revs were either too high or non-existent. The only way to get the engine to idle, which is fairly essential for low speed maneuvering without crashing, was to hold the handle in the right position with your hand through the steering wheel. Still, it only weighs 19 tonnes and has no brakes. What can go wrong? Luckily, we had an extra crew member. My brother, Uncle Adam, joined us for the weekend. He’s hoping to join us as crew if we ever cross the Atlantic so he was eager to get involved. 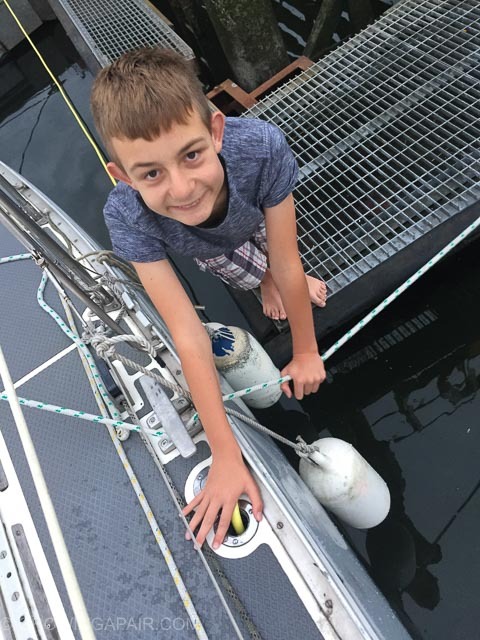 He’s quick to learn and definitely physically stronger than a ten year old so he was really helpful at fending off other boats and pontoons. Dez did a fantastic job of not crashing into other people’s boats on the way out. When we turned into the River Orwell, the huge sigh of relief could be heard the other side of Southampton. After a day motoring up and down the river, we had to get the boat back into it’s little space again. A helpful person told us we could just park it on the fuel pontoon. This was a bit like controlled crashing, without the control part, only to be told we couldn’t actually park there. I though Dez was going to cry. Ten minutes later, after help from the locals and much heckling from the direction of the Yacht Club Bar, we had parallel parked back in our little space. We made Dez sit down and drink cold beer, while we put his underwear on a boil wash. 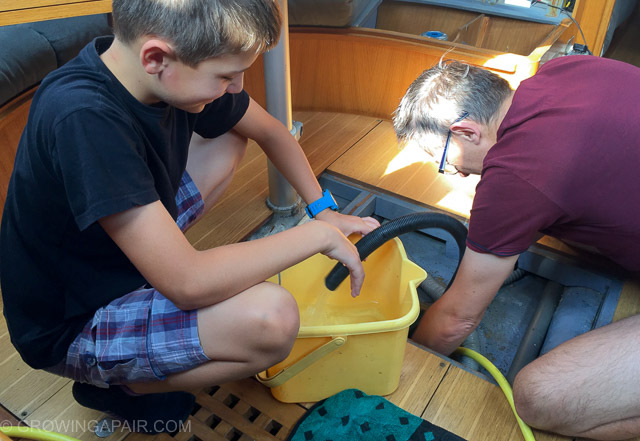 The boat wasn’t really dirty but still everything needed to be cleaned, wiped and vacuumed. There are a lot of storage spaces on a boat. It took many weekends to find them all. They hide under bunks, behind chairs, under the floor and behind other cupboards. Everything had to be emptied and cleaned out. The previous owner left a lot of stuff too, which needed to be sorted out and mostly thrown away. When we had found all the holes to keep stuff in, we had to put our own stuff in them. And then rearrange the stuff. And then rearrange it again. And again. Sam and Evan mostly messed around in kayaks and lounged in hammocks reading books. Sometimes I wish I was ten again. Stuff found behind one of the seats. Just need to figure out what all this is, and if we still need it. 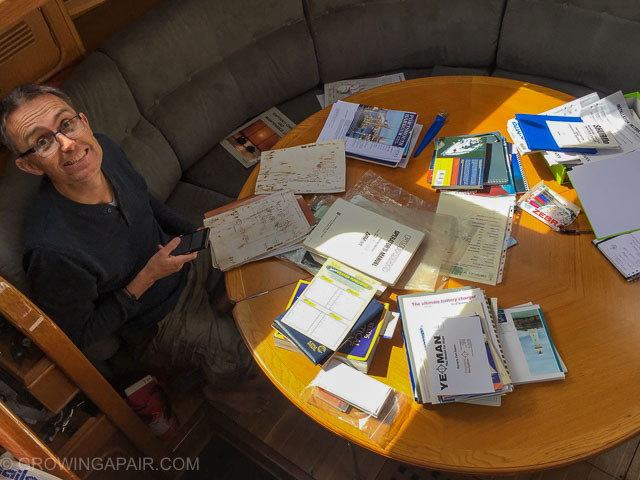 We spent hours going through the paperwork that was left on the boat. Fascinating stuff. The original drawings for the boat from 1989 are beautiful! 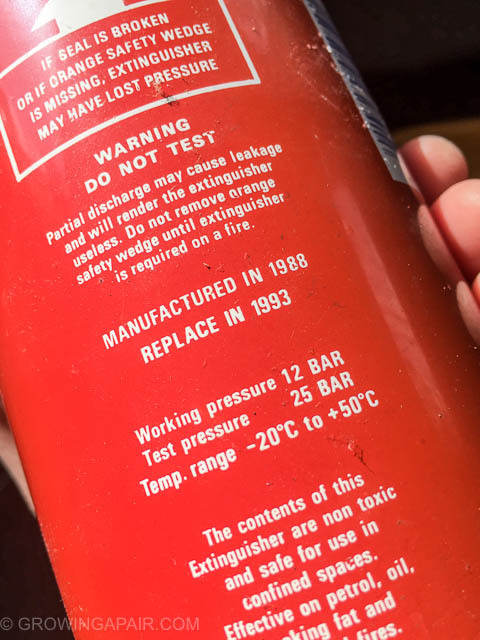 There were six fire extinguishers on the boat – all out of service long, long ago. This one should have been replaced 24 years ago. 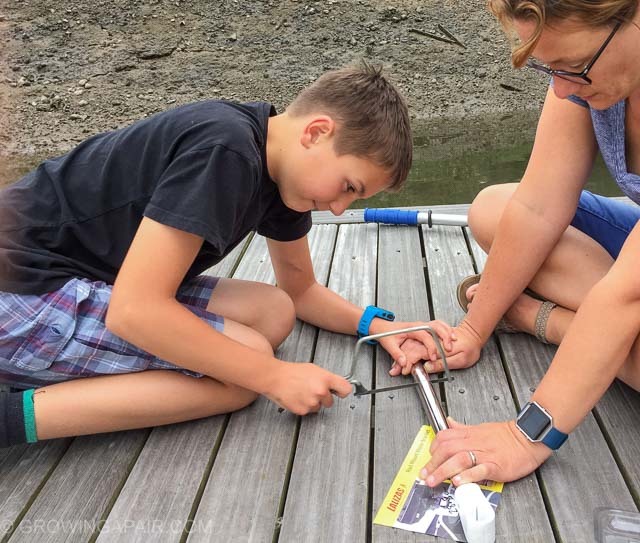 Our boat survey came up with several issues that needed resolving before we could sail the boat home to Portsmouth. 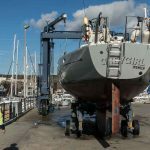 While in Ipswich we had the engine throttle cable replaced (see above), the chain plates removed and re-bedded, halyards and furling lines replaced, the topping lift replaced, the winches serviced and the furling drum fixed. We did some work ourselves too. Uncle Adam installed an automatic fire extinguisher in the engine room. We replaced all the manual fire extinguishers and some of the old, flat fenders. For Gappy the dinghy, we installed a bracket for the outboard engine and sorted out straps for the davits. We replaced all the halogen lightbulbs with LEDs. Gotta save the batteries, you know. We need better tools. The spare hacksaw blades went over the side and we both got splinters in our hands. There are two fresh water tanks on the boat. The large one (600 litres) hasn’t been used for a very long time, judging by the colour of it. ‘Clean minging large water tank’ is now written on the end of a long ‘To Do’ list somewhere. Cleaning and disinfecting the small tank took ages and it only holds 200 litres, but at least we have water coming out of the taps. A nice glass of swimming pool water, served at ambient temperature, anyone?? Sam filing the water tank. 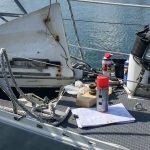 After figuring out how to feed the headsails onto the sticky up pole things and run some ropes down the boat through some round metal things to the winches, we realised we had no bloody idea what the hell we were doing. 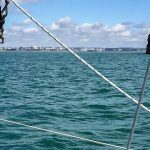 The RYA Day Skipper course had taught us about furling lines, halyards, tacking and gybing but not how to set up the sails and lines on a 27 year old cutter rigged yacht. When Kevin put his pint down, walked down to our boat and suggested hiring someone to help, we knew we were out of our depth. Adie Gilson is a rigger who worked at the boatyard for many years. He knows his stuff about rigging, something that we weren’t happy taking a chance with. He helped us set the sails and lines up properly and taught us loads of stuff about rigging. 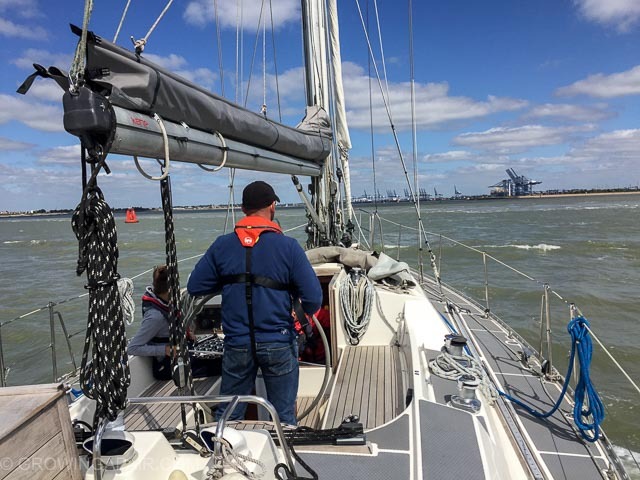 We hadn’t been comfortable putting the sails up without having the rigging checked first, so Adie came out sailing with us, down the River Orwell. He has loads of experience with Oyster Yachts and how they handle under sail and under power. It’s amazing how much you can learn from just a few hours with someone who knows stuff. The marina sits 10 nautical miles from the sea, up the very pretty River Orwell, surrounded by beautiful Suffolk countryside. As pretty as it is, it’s still not the actual sea, it’s a river. It takes a whole two hours on our boat to get to the sea. To the untrained eye, and those without charts and a depth gauge, it looks like a really wide river. It’s not though. The dredged bit down the middle is really quite narrow and not particularly well marked in some areas. This is quite scary for numpties who have just bought a boat that is waaaay too big and heavy for their experience, and has a huge 2m long lump of metal hanging off the bottom. 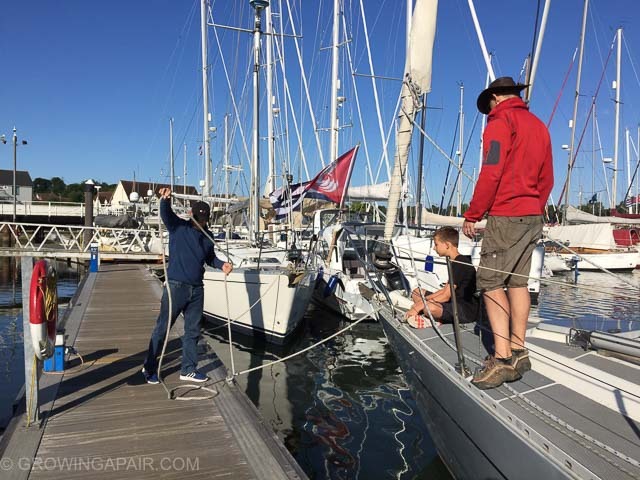 Putting the mainsail up involves turning the boat into the wind and getting a 12 year old to winch the sail up the mast using his pigeon-like muscles, while the grownups point the boat in the right direction and pull on ropes at the mast, and the 10 year old sorts out other bits of rope. This takes some time and the wind ALWAYS blows ACROSS the river, meaning that the boat has to point at the river bank, moving slowly towards the steep bank of thick mud just below the surface. No stress there then! Also, the hills and big clumps of trees along the river cause random gusts of wind to come from nowhere. Awesome. That’ll help…..not. Evan not feeling the stress. Once the sail was up though, the feeling of being pulled along the river using the power of the wind was fantastic. I’d like to say that the silence was breathtaking, but we weren’t brave enough to turn the engine off! We did it though. We sailed along the river several times, with and without Adie. We motored a lot as well, practicing pulling up to buoys and reversing in a straight line (not as easy as it sounds). We got all the way down to Harwich and almost out into the actual sea. Uncle Adam came out with us a few times and glued himself to the helm. Granny visited for a weekend and did a very god job of trying not to look terrified. Oooh so nearly in the sea…. Harwich in the distance. During the biggest spring tides, the entrance to Fox’s marina becomes about 30cm wide and has a “doorstep” of silt to get over. The green marker buoys lie flat on the mud. Disappointingly, nobody thought to mention this to us. We ran aground twice trying to get back into the marina. Eventually the harbourmaster suggested we ignore the marker buoys, stick exactly in the middle of the channel and just “go for it”. The Almanac doesn’t mention this. A bit of local knowledge goes a long way. Needless to say, Dez’s pants needed another boil wash that evening. Despite all the hard work and stress, we have had an absolutely lovely time in Ipswich. The weather has been warm and sunny, despite this being the British summer. Rum and coke has been sipped in the evenings while sitting in the cockpit, watching the setting sun and the river wildlife. We even saw our first ever wild otter swim past. We’ve had leisurely breakfasts on the deck. The boys have had lots of fun paddling kayaks, rowing in Gappy and annoying other marina users. 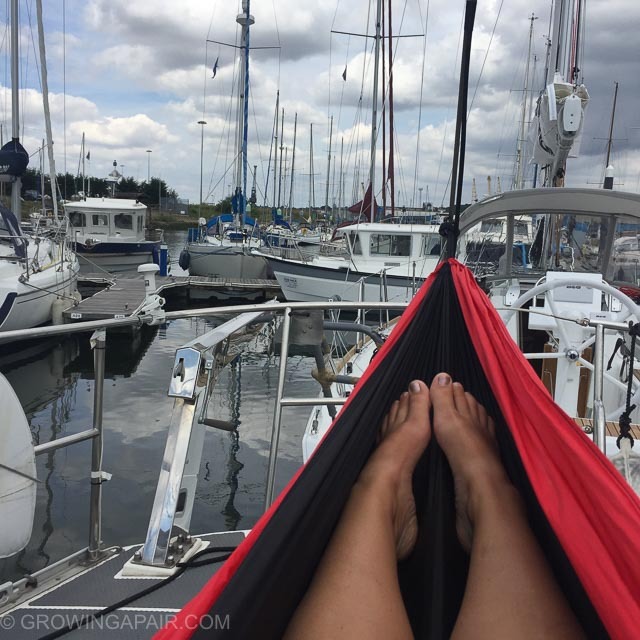 They have loved lounging in hammocks and eating chocolate cake from the Yacht Club bar. We’ve had visitors. Uncle Adam came down for a few weekends to help out. Granny visited for a weekend. Our friends from Portsmouth, Laura and John, popped in for a cup of tea. It was lovely to see Jeremy, Helen and their dog Ben too, our first dog visitor. 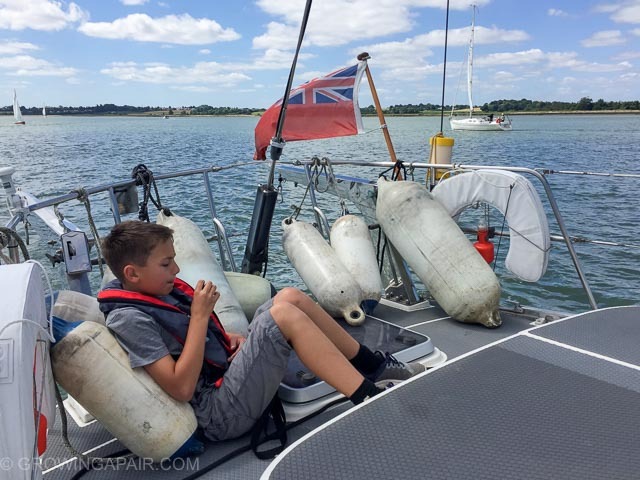 We ended up hiring a skipper to help us sail the boat back to Portsmouth. In hindsight, we could easily have done this ourselves, especially as there was no wind to speak of and we had Uncle Adam to help. But knowing we had someone on board who had done that journey dozens of times just made the whole experience much more enjoyable. Paul the Skipper knew the way across the Thames Estuary and through the huge wind farm. He knew the rules about the ferries at Dover. He knew all about the dangers of passing through the Royal Sovereign Shoals in the dark. We learned loads and saved on laundry bills for Dez’s pants. Everyone’s a winner. We wouldn’t have attempted the journey non-stop without Paul the Skipper either. It took 29 hours, but it would have taken several days and a few nights in marinas otherwise. 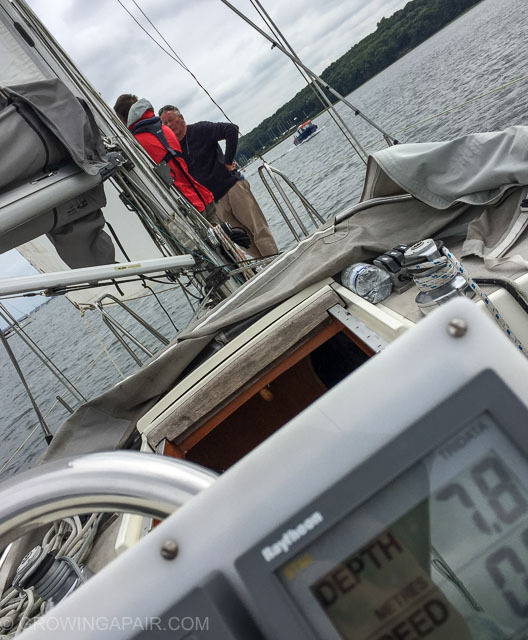 Read all about the journey home here – Sailing Home – Ipswich to Portsmouth in 29 hours. We were a little sad to leave Ipswich. It felt like going on a camping holiday every weekend. We won’t miss the driving though. And now, if we accidentally leave all our coats on the boat, it doesn’t involve an eight hour round trip to collect them. Love Ipswich. Prefer Portsmouth though. Great adventures. 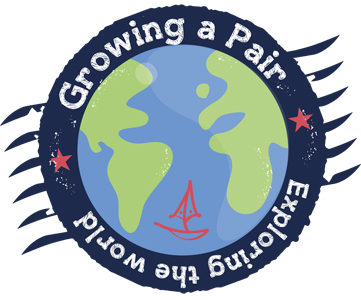 We are thinking of sailing for a year or two as well. 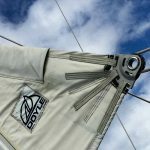 I was interested in your comment about backpacking being an inefficient way to see the world and this being a trigger for thinking about sailing. My worry for us is that actually sailing is very inefficient. For example, you have already sunk a huge amount of time, effort and money into the boat and not yet really gone anywhere in particular (sorry I exclude Ipswich). Pre kids my wife and I took a year off to sail and there is fair degree of similarity in the days and weeks, as well as the destinations which I worry about with the kids, rum cocktails not being their thing…. That said, the thought of travelling without a base with kids terrifies me and having a home base provides a great anchor (sorry) for them. In my dreams we get closer as a family and adjust to a less materialistic and different pace of life, enjoying nature’s wonders. In my nightmares, the kids are bored and miserable in their very small floating house and spend most of their time reminding us of this! Not sure I have a point but safe travels and I look forward to following your continued adventures. Great piece! We just purchased our first boat, Catalina 400, Houston TX- also a four hour drive for us until hurricane season is over and we can bring her closer. I am SUPER new to sailing but my partner is not so hopefully it’ll balance out.. our girl is seven.. many adventures to be had! Good luck, keep writing! Fantastic, Tanya! Good luck with your adventures! Hurricane season will be over soon, thanks goodness!